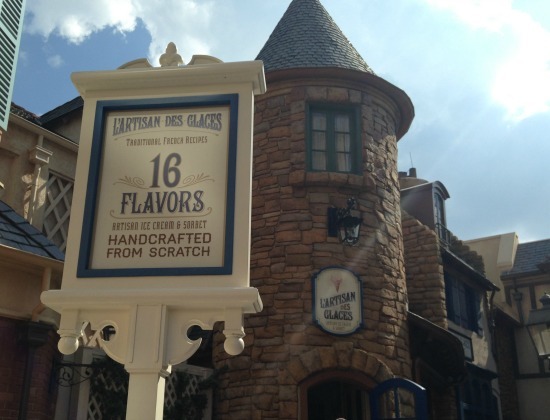 I was at Walt Disney World this past weekend and one of the stops I knew I had to make was at L’Artisan des Glaces, which is located in the France Pavilion at Epcot. 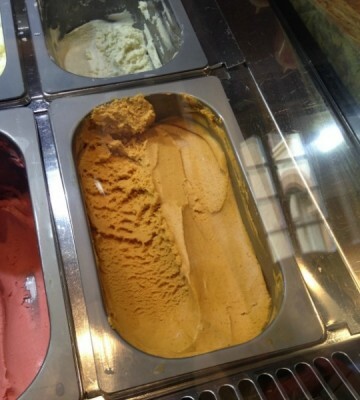 They have been talking up their brand new Pumpkin ice cream and I’d been dying to try it. 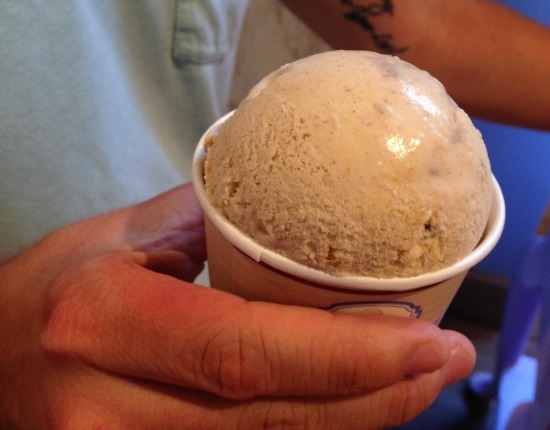 In addition, they’d previously been hyping their Cinnamon, Caramelized Apple, and Crumble Crunch ice cream. Both seemed to be amazing Fall flavors that I knew I had to try, as they both sounded amazing. 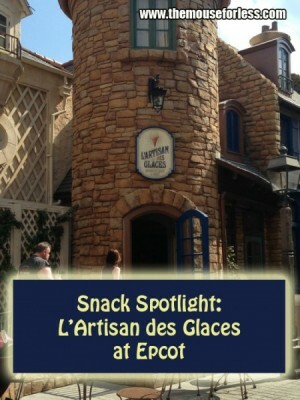 L’Artisan des Glaces is a relatively new addition to Epcot. 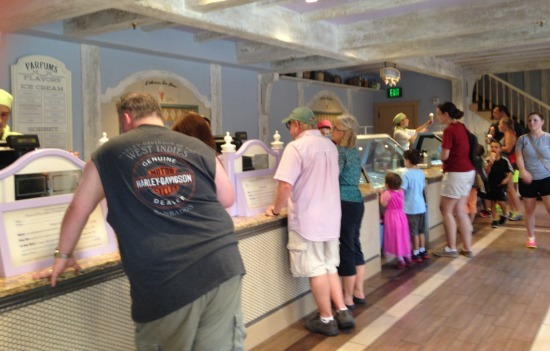 The shop opened in the former location of the Boulangerie Patisserie (which moved to the back of the pavilion) in the spring of 2013 and while I’ve been wanting to stop there, part of the reason I hadn’t yet was because there are just so many great choices around World Showcase. If I ate them all, I’d burst! But with the addition of these two new unique flavors, I knew I could wait no longer. When you enter the small space, you are greeted with cool blue and white colors. The location features lots of homages to milk, which of course, makes sense due to the ice cream connection. 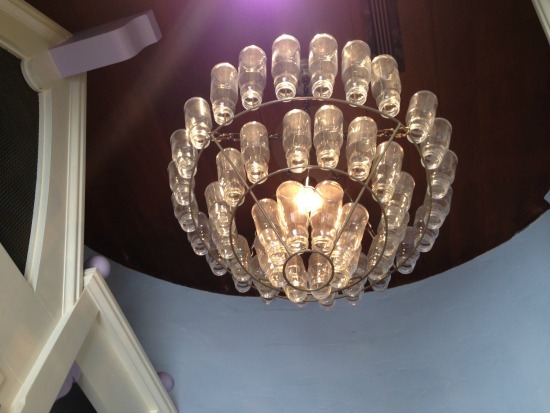 I love this really cool chandelier! While you’re looking at the menu, it’s so hard to decide! 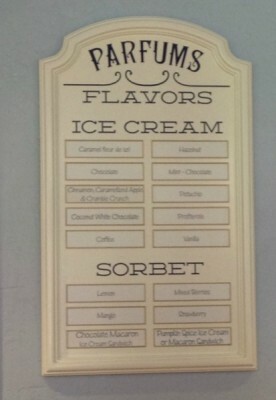 They have 10 different types of ice cream, along with 6 different types of sorbet to choose from! While ice cream is what they specialize in, which can be served in a cup or a waffle cone, they have other treats available that utilize the ice cream. They have brioche sandwiches, ice cream macaroons (I must try this one the next time! ), and ice cream martinis, which feature a shot of alcohol with your ice cream. Good lord! How do you choose?! I finally decided to just get the pumpkin ice cream, since my brother chose the cinnamon and caramelized apple. Wow…was it delicious! It was very creamy and had a rich pumpkin taste. The nutmeg flavor was extremely present but not overpowering. It wasn’t overly sweet either. It was just pumpkin-y. So, of course, I also asked to have a few bites of my brother’s option, the cinnamon, caramelized apple, and crumble crunch. I think this was my favorite! It tasted like apple pie a la mode, just in complete ice cream form! It was also extremely creamy, had a great apple taste, and was very sweet. It was a classic ice cream! Honestly, when I’m back at Epcot next week, I will probably make sure to stop in and grab another scoop of this treat. The only thing I wish that they could do would be to allow for guests to get a sample taste. Since they have such delicious flavors that make it hard to choose, it would have been nice to have gotten to try it before I committed. If I had done that, I actually may have chosen the apple one over the pumpkin. (Again….I want to be clear…I enjoyed both immensely! So I don’t feel as though I made a wrong choice in getting the pumpkin. I just wished I’d had the option to test between the two to really have had an informed decision.) I get that people may try to take advantage of the product though, but since you pay for it ahead of time, it’s not like you’re going to just go in to sample and leave. 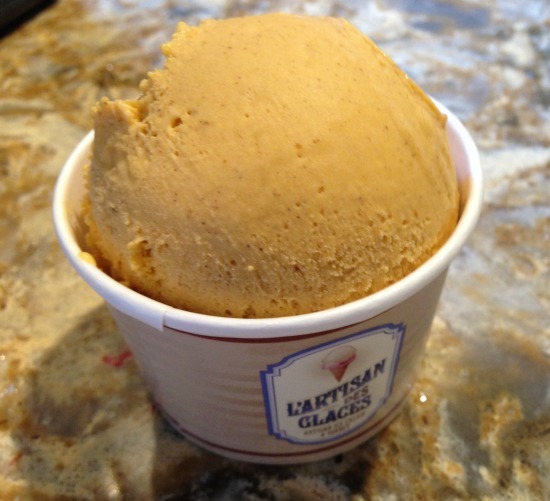 Now that I’ve officially made a stop at L’Artisan des Glaces, I am happy to say it will certainly not be my last. The treats are delicious and they are always coming up with new, creative snacks to devour. I appreciate their inventive nature and I cannot wait to see what their next creation will be because it will likely be delicious and unique! What are your thoughts? Have you stopped in here yet? Disney Vacations During Peak Season – You Can Do It!